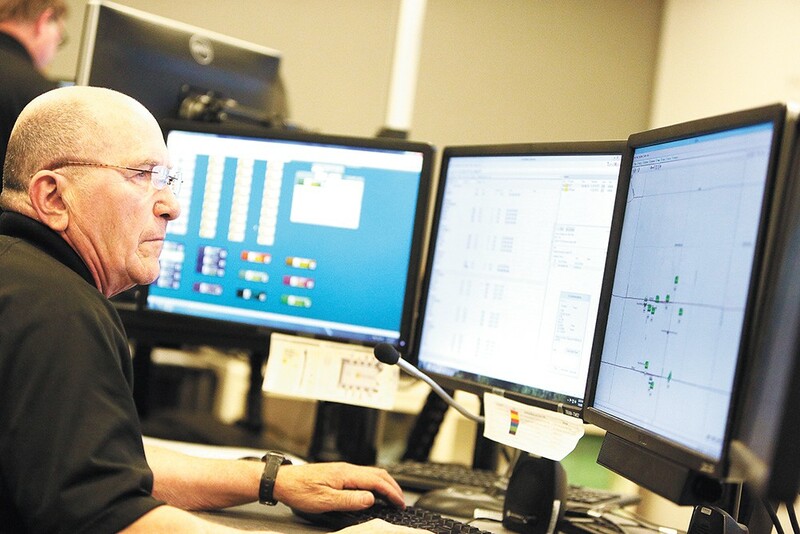 John Schlabach monitors buses around all the city from the Spokane Transit Authority communications center. Waiting at a red light, whether at an empty intersection or behind a train of 20 cars, can feel excruciatingly long. Waiting for a late bus, getting there 10 minutes early just to be sure, can feel even longer. Waiting for a plane to take off, after an unexpected two-hour-long delay on the runway, can feel like an eternity. However, the Spokane region is waging war on obsolete transportation with smart intersections, reactive public transit and a data-saturated airport. Futurists have ambitious hopes of hyper-speed trains and driverless highways, but those days are far off. In the nearer future is the Spokane Transit Authority's Central City Line, a rapid electric bus route planned to connect city's the eastern and western reaches. But before becoming beehives of whirring electric vehicles and buzzing pizza delivery drones, cities around the country are addressing the most pressing issues first, like keeping traffic moving, getting cars off the road and creating an area where transportation is efficient and easy to use for newcomers. The intersection at Division Street and Magnesium Road is a lot like others in Spokane. Magnesium slices across Division's six lanes while traffic flows in every direction. Homes, businesses and a school make sure the intersection stays busy. While it looks like any other intersection, this is one of the most technologically advanced in the city. Here, traffic moves with the help of a vehicle detection and data collection system called Gridsmart. The system is a series of sensors around the intersection that feed information to a processor connected to the traffic lights. Gridsmart cameras also provide a video feed, allowing the city to adapt to traffic changes as they arise. "It is extremely valuable in that we can monitor in real time," says Val Melvin, one of the city's senior traffic engineers. Traffic lights are one of the oldest features of transportation infrastructure, and they aren't going anywhere. The key to keeping traffic moving through intersections comes down to the timing of the lights, Melvin says. Gridsmart makes sure the duration of the lights makes sense for the amount of traffic and in which direction it is flowing. "If detection isn't good, then the signals aren't good," Melvin says. The feedback on Gridsmart has been positive, she says. So much so that the city hopes to install them at every major intersection in the city. For now, only three are installed, and one more is planned. Exactly how many Gridsmart systems the city ends up with depends on securing funding for them. The intersections of yesteryear had pressure plates under the road that communicated with traffic lights when drivers pulled up to them. Melvin says Spokane has left pressure plates behind in favor of magnetometers, which detect vehicles by sensing changes in magnetic fields. However, pressure plates and magnetometers have a common flaw. To repair or maintain them, workers would have to uproot the sensor, resulting in at least one closed lane in an intersection at a time. Melvin says the best traffic detection system would not cause more traffic and would keep workers out of the roadway as much as possible. The natural solution was to move the sensors above ground. Like many cities, Spokane chose a radar detection system that perches on light poles around intersections. The radar just has to be pointed at the roads, and traffic-light times are adjusted according to the density of traffic moving through. Melvin says this system is not perfect, either. If lanes in an intersection change, a worker would have to climb the pole and adjust the radar accordingly. One of Gridsmart's most valuable features, Melvin says, is that it can be adjusted remotely. No pole-climbing is required if road work closes a lane. Gridsmart also collects data on traffic, like how many wheels a vehicle has, and in which direction it is traveling. Armed with Gridsmart-collected information, transportation managers gain a better understanding of which intersections see the most traffic and can design more efficient infrastructure. Keeping track of the Spokane Transit Authority's fleet of 147 buses is a massive challenge for Fred Nelson and his team of transportation directors. With the help of new technologies, the challenge is no longer reacting to factors influencing the flow of buses, but predicting them. "For public transportation in Spokane, this is light-years ahead of what it was," Nelson says. The new-age communication center now looks like a well-lit war room, complete with computer monitors on swiveling arms, wall-mounted television screens with maps and live cameras. This is the combination of the STA's Computer Aided Dispatch and Automatic Vehicle Location System, or CAD/AVL, and a stream of information brought in through the Spokane Regional Transportation Management Center, or SRTMC. "This is a pretty significant hub we have here," Nelson says. "The public has no idea what we have at our disposal." Using CAD/AVL alongside SRTMC camera feeds, Nelson and his team know where each bus is at all times, who's driving it, how many people are on it and how traffic will affect its route. As recently as 2012, STA was keeping track of buses with paper schedules and radio communications. "We knew where they were supposed to be, but didn't know exactly where they were," says John Schlabach, a route supervisor. Schlabach recalled a time recently when an STA vehicle's wheelchair ramp was damaged. He was able to locate the bus, contact a nearby city worker for repairs and guide other buses to keep the pace, all through the CAD/AVL system. The technology helps in more than emergency situations. Schlabach is just one of the multiple route overseers who keep their eyes on STA vehicles during all hours of operation. They've come to gain an understanding of how to alleviate common problems. For example, when lots of riders getting on and off a bus drag it behind schedule, someone in the communication center will know how far behind schedule it is, and how many people ahead need the ride. To take pressure off the driver, the communication center will dispatch another bus to slide ahead of it, picking up its would-be riders, allowing it to unload and get back on track, Nelson explains. He says trying tactics like these before CAD/AVL resulted in buses chasing other buses, while the communication center tried to remotely locate both. Now, STA can even build detour routes from the communication center and relay the changes to the drivers. Nelson estimated that the Hoopfest detours were built two weeks in advance. Then they were programmed to begin on a timer, and drivers received the new routes as soon as they took effect. Nelson says STA regularly builds detour routes to avoid traffic clogs on the highway and other congested areas of the city. "We were reactive. Now we are proactive," Nelson says. Technology in air travel and aviation does not come in leaps and bounds. Due to the nature of the industry, everything has to be scrupulously tailored, and there are very few universal truths between airports. Spokane International Airport's list of challenges includes millions of square feet of pavement that has to withstand frigid winters and scorching summers, foggy landings, shared airspace with an Air Force base and, of course, other airports' shortcomings. As director of Operations and Maintenance, Ryan Shaheen and his team tackle many issues at once with the help of technologies in their communication center. "It is a pretty big job with a broad scope," he says. Shaheen's department inspects the pavement at least twice a day, usually more. They can't take a magnifying glass to every square foot of the runway, but do know which parts of the runway have required the most maintenance in the past, and which parts are likely to need it, based on an interactive digital heat map created with PASSUR Aerospace's data platform. Weather affects the runway's pavement the same way it affects city streets, Shaheen says, but the airplanes cannot land on runways riddled with cracks and potholes, so maintenance demands more than a watchful eye. Operations and Maintenance also keeps track of the runway's grip. Airport vehicles, generally SUVs, are fitted with sensors that measure the friction between tire and runway. PASSUR aggregates data from multiple sources at a time, like the National Weather Service and the Federal Aviation Administration, to provide relevant information on past maintenance projects and weather trends that will affect the runway's performance. Through the communication center, Shaheen can track down one broken light among thousands, or one worker painting lines on the runway more than a mile away from his desk. Maintenance and Operations keeps an eye out for lulls in runway traffic by tracking many of the same factors in the air and at other airports through PASSUR. They can know if weather at Dallas/Fort Worth International Airport is holding up planes, or if an aerial firefighting plane 30 miles away needs to land for maintenance. Shaheen points to an orange-and-white checkered shack next to a 20-foot-tall antenna tower. Together, they are the glide slope station. The system transmits information to the control tower and the pilots, allowing them to land planes in almost blinding fog. However, Shaheen says, they would never take a chance on a landing that risky. He says that every airport has a complicated web of technologies, all working toward the common goal of a safe flight, but no two are the same.